Christmas, Hanukkah, Thanksgiving, New Year! It is a season of celebrations filled with high hopes and holiday music in the air. My family always enjoys listening to holiday tunes to put us in the spirit of the season. 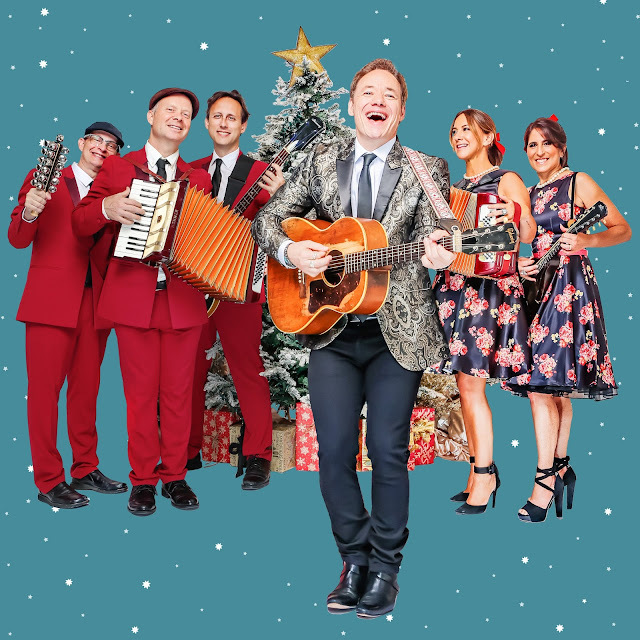 This year we'll have some new songs to enjoy as Brady Rymer and the Little Band That Could have released Revvin' Up the Reindeer, a fresh album featuring 13 cheery, all-original holiday songs. Revvin' Up the Reindeer is the ninth album for families by the three-time Grammy nominated musical group. Not only does the album reflect the festive atmosphere of this time of the year with caroling harmonies, brass, and bells incorporated into its songs but every track is also inflected with the band's rootsy, feel-good sound. Revvin' Up the Reindeer instills a recollection of classic holiday tunes with songs that have their own distinctively fresh and engaging style. The title track of Revvin' Up the Reindeer is a 50’s rock ‘n’ roll romp, imagining Santa with a souped-up sleigh; the ska-beat “Holiday Jam” is a humorous take on the many ways we cope during the busiest time of the year; lyrical accordion embellishes the Klezmer-inspired "Rainbow Candles;" the hopeful sing-a-long “Christmas Wishes” radiates with a children’s choir “The Fa La Las;” and the band rings out the old and swings in the new in raucous, Dixieland jazz fashion with "Baby New Year." Indeed, whispers of holiday standards weave cleverly throughout, conjuring up the magic of the holiday season. A Geek Daddy has a Revvin' Up the Reindeer CD to giveaway! Follow @Geekdad248 and retweet the embedded message below for a chance to win it. Must be a United States resident over 18 years old to participate. Valid entries must be received before 11:59 pm ET on Sunday, November 19, 2017. A Geek Daddy will randomly select one entrant to win the CD and Brady Rymer's publicist will be responsible for mailing it to the giveaway winner. Good luck! Revvin' Up the Reindeer is available on Amazon, iTunes, Spotify and through other musical sources. For more information about the band, swing over to bradyrymer.com.